As those of you who’ve read my last few posts will know, my mother and a family friend, Jeanie Daskais, joined me on the road through Greece, Albania and Montenegro. My mother had been volunteering in refugee camp clinics on the eastern Greek island of Lesbos, and decided to join me as I cycled north from Athens. It was a real comfort having them with me. The one thing I consistently miss about my life back home is the opportunity to build long-term relationships with people. It’s not a question of language or compatibility–I meet kind and interesting humans wherever I go. I’ve made new friends faster in the past year and a half than I ever had previously, but the thing is, they can’t last. A day or two later, I move on down the road. Having my mom and Jeanie with me joined my life on the road with a sense of home. Even though they’ve now returned to the U.S., it’s still easier to find the energy to write, to get going in the morning and to keep pedaling up the last hill of the night. Old City/New City: In Athens, it’s hard to forget that today’s global civilization is built on the ruins of societies that rose and fell in their time. NASA quotes Harvard archaeologist Jason Ur as saying that there is little evidence of past societies making coordinated efforts to adapt to changing climatic patterns. Now, in the face of our own rapidly changing climate, many of our food production systems are already seeing decreases in productivity. Our ability to predict and communicate on climate change is much improved compared to past civilizations, so I guess the question is, Can we coordinate? Athens has a strong and vibrant street art scene. Many graffiti artists travel the world and put up art in the cities they visit. In Athens, I had a weird moment of déjà vu when I came across distinctive murals of Juan Fernandez hummingbirds–the signature of Chilean artist Charquipunk. I counted 32 small-scale solar installations over a 230-kilometer (140-mile) section of road between Athens and Lamia, Greece. 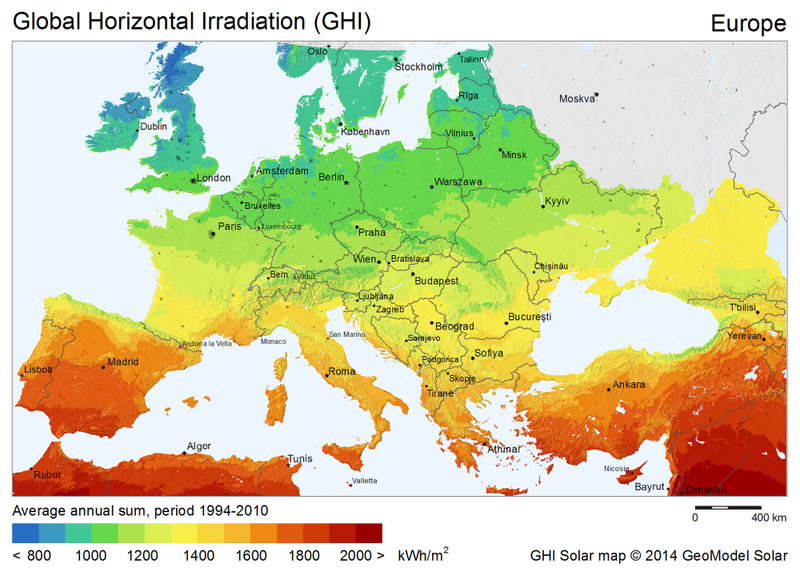 Greece receives significantly more solar radiation than the more populous and wealthy countries that lie to the north (map), but has so far lagged behind them in building out new solar generation capacity. Greece accounts for 85 per cent of Europe’s cotton production, much of it in the mainland’s central region (pictured). Water scarcity is an increasing problem worldwide, much of it exacerbated by climate change, and unfortunately, cotton is a thirsty crop. Greek cotton production is more water-efficient than most, and yet one kilogram of its fabric can take nearly 7000 liters of water to produce. Jeanie (in green) and my mother pedal towards the cliffs that hold the famous Meteora Monasteries. The Monastery of Varlaam (14th c.) in Meteora. Christians lived in this area for centuries before attacks from Turkish forces prompted the monks to take to the cliffs for shelter. Monks love their wine. The International Organisation of Vine and Wine predicted last week that 2016 would see a 5 per cent drop in world wine production compared with 2015. They gave primary credit for the decrease to “climatic events.” Human-caused climate change will likely make wine cultivation untenable in historically prominent regions like Bordeaux and Alsace, though other areas may increase their production. Torrential rain greeted us as we hiked to the monasteries, but as we reached the top of the cliffs, the sun broke through and mist began to roll off the valley. Roussanou Nunnery in Meteora, Greece, with the Monastery of St. Nicholas Anapavsa in the background. In the old days, monks reached the monasteries using retractable ladders and hoisted their goods on wooden cranes. We descended through a wooded valley just as dark was falling, and this was the view that greeted us. We climbed a good amount over the next few days. Some might say too much. …but we had our just rewards. The ingredients for this meal of steak, potatoes and greek salad were all grown locally, in the small community at the top of our last pass before the border. once again, great pictures and commentary. Thanks, Forest. Re monasterys : Interesting how built forms are cued to adjacent natural forms. Especially at Vaarlam, where middle-right pavilion size and even specific columns grow directly out of rock below. I thought the same. Not many such monasteries that I’ve seen have made such an effort to conform to the structure of the rock.